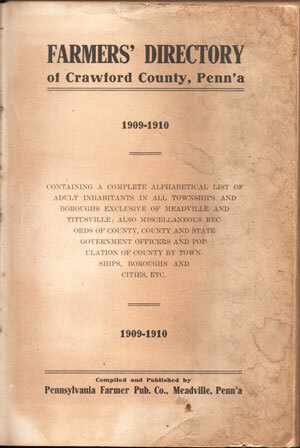 Published by The Pennsylvania Farmer, Meadville, 1909-10. Cover has wear and is rather dark. First ad page is frayed. Title page (shown here) has stains. Inside pages are overall nice and clean. A few pages are darkened from a newspaper clipping placed inside. No map. A directory of farmers that includes the name of farmer and wife, size of farm, and more details. Hardbound, 304 pages. Also includes numerous business ads.